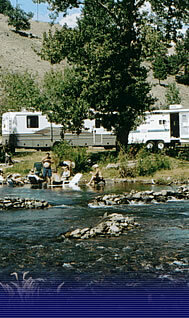 Moon Shadows RV Park and Campground is located to the South of the City of Merritt, BC along the spectacular Coldwater River. Easily accessible, Moon Shadows provides spectacular destination family camping combined with an ideal location for many day outings. This campground boasts many services and amenities, including: laundry, public restrooms with shower areas, a large group area on the river and a small convenience store. Moon Shadows is on part of the renowned Merritt Mountain Music Festival property. In fact, during the annual country music festival this campground is rented almost a year in advance. All of the campsites provide access to the spectacular Coldwater River and are set back within the beautiful trees. Red rock pathways and roads wind their way throughout the entire campground. The site is secure, immaculate and clean. It is a truly beautiful and scenic area – perfect for camping. Nothing could be more enjoyable. Moon Shadows caters to all visitors and tourists that love to camp in an RV or in a tent. It has everything that you need and it's very beautiful and often sunny and warm. Moon Shadows is near many enjoyable recreational attractions, activities and amenities. We invite you to enjoy a great vacation getaway at Moon Shadows RV Park and Campground. Webmaster: ChrisHartDesign - Photo Credits: Dee Lippingwell - Copywrite 2004 Moon Shadows - All rights reserved.